In fair Verona, where we lay our scene, Thomas Pessina (keys, synths, and backing vocals), Michele Zanotti (electric and acoustic guitars and sax), and Alessandro Danzi (bass) decided in the summer of 2012 to form Il Rumore Bianco. They had been playing together in another band, but wanted to explore new musical territory, so they enlisted Frederico Lonardi (electric and acoustic guitars), Eddy Fiorio (lead vocals), and Umberto Sartori (drums) to round out the band. Their goal was to distill the music of the past several decades and create a fusion of 70s progressive rock, jazz, electronic, ambient, and experimental music. 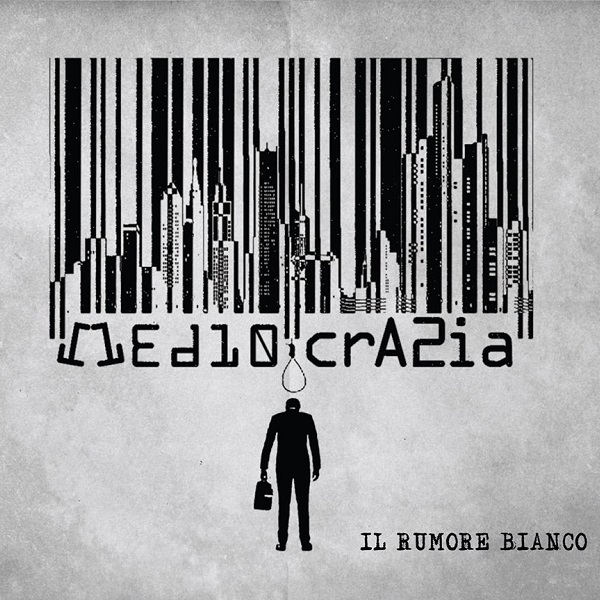 In May 2013 they began work on their first EP, Mediocrazia, that they released in November 2013. Mediocrazia contains four songs that coalesce conventional 70s progressive elements (Hammond organ, Mellotron, and hard rocking guitar) with an exotic blend of jazz (sax) and King Crimson. There are a few rough edges, but by and large they have successfully achieved their goal. The first song, “Tutto un Sogno (parte1),” opens with a magnificent organ swell followed by some excellent 70s rock. The second song, “Il Vestito Buono,” features some tasty piano and Mellotron licks. The third, “Il Primo Attore,” begins as rock and roll and then morphs into Italian jazz-rock with the addition of saxophone, referencing Area and Rocky’s Filj in both the vocals and music. However, Eddy Fiorio does not copy either Demetrio Santos or Rocky Rossi; Eddy has his own style that is an excellent complement to the rest of the band. The fourth and closing song, “Tutto un Sogno (parte 2),” is a quiet and much calmer than the rest of the songs. And here is where there is a strong resemblance to King Crimson’s In the Court of the Crimson King. All in all, an excellent debut release from this new Italian band, which promises great things to come.